There are many features within a custom home that contribute to its overall look and feel. Whether your style preference is more modern or rustic, your choice of cabinets greatly affects the look of your entire home. Stop for a moment to think about all the spaces that include cabinetry – kitchens, laundry rooms, bathrooms, dens, theater rooms. With cabinetry in all these rooms, you begin to realize how important they truly are. When selecting cabinetry, the most obvious choices include which style or finish you like best. Equally important, however, is how the cabinets will function for your lifestyle. Cabinetry can incorporate built-in appliances. Or custom cabinet faces can conceal or camouflage your appliances to match the rest of the cabinetry. There are also a wide variety of built-in amenities to consider including with your cabinets. Examples include wine storage and pull-out shelving to built-in spice racks or cookware and cutlery organization. Once you have an idea of how you need your cabinetry to function, you can concentrate on the way it looks. The style of cabinets can range from modern clean lines to ornate detailing and paneling. When it comes to the materials and finish of your cabinets, the options are almost endless. The materials can include a variety of wood species, reclaimed materials, glass, or even stainless steel. The finishes can include stains, paints, glazes, distressing techniques, or a combination of any or all of these. The finish of the cabinetry can go a long way in creating the atmosphere you are looking for, from a rustic cabin to the eclectic trend setter. In addition, the cabinet’s construction can dictate its style. Framed cabinetry is the more traditional style that reveals the frame of the cabinet face between the doors or drawers. In other words, you can see the frame between and above the doors. Frameless is just the opposite. The frame of the cabinet is concealed because the door or drawer covers the entire frame of the cabinet face. 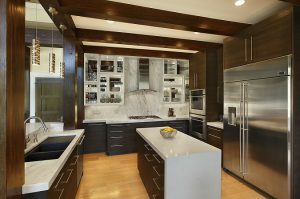 Frameless cabinetry creates a more seamless, modern look. 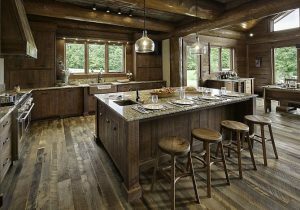 As you look at the possibilities, you may ask if choosing to build a timber or log home has an impact on your choice of cabinetry. You may be surprised to learn that your choices are not at all limited. 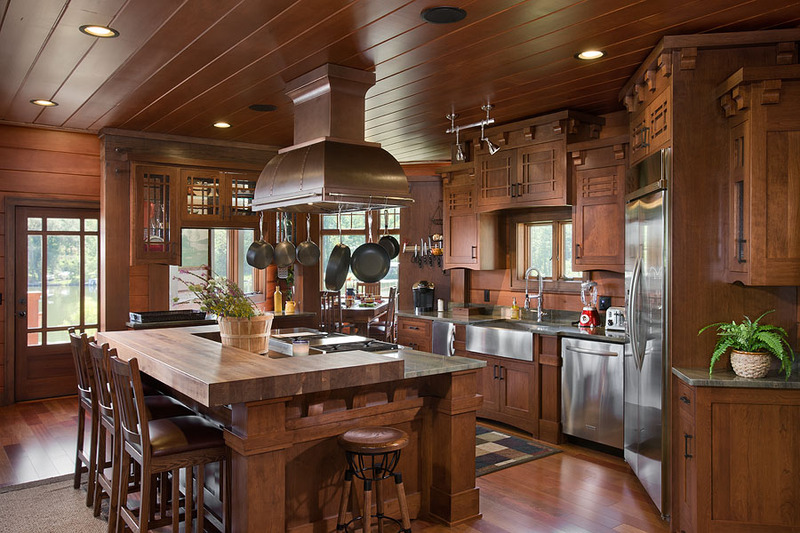 We have seen timber and log homes with everything from stainless steel cabinets to traditional ornate oak and the occasional rustic reclaimed look. It is all up to you and your personal choices. Log walls can accommodate any style of cabinetry, so keep your options open. Visit the PrecisionCraft kitchen and dining room photo gallery to gather inspirational cabinetry ideas.